x_man586 had the most liked content! The stock fit with very little work but the hand guard was very tedious. A lot of test fitting and sanding. What is the functional difference between double hook and single hook. I have Texas AK triggers in all of my rifles. 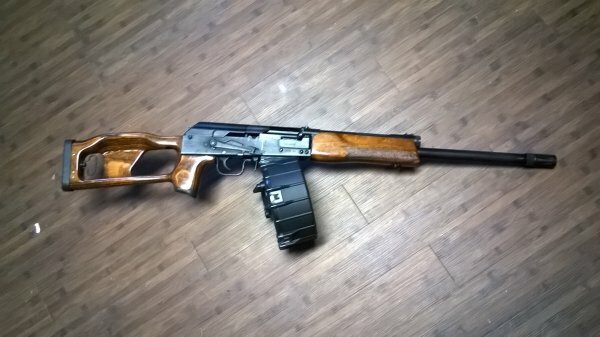 Here is mine with Dragunov type stock. Turkey shot is brutal. When I bought my Mossberg 500 I bought every round I could find. I shot the smallest first #8. I figured I would get to the buckshot before it started hurting. The #4 turkey shot kicked way worse than 00buck ever did. What do I get next? x_man586 replied to x_man586's topic in General Discussion - Any topic is welcome here!!! Yeah the 30-30 my dad has came from his dad who bought it in 1957. Guys I appreciate your opinions. Thanks. I know that don't need another firearm, but I have a couple of ideas what my next one will be now. I also see some other things that I can improve on. Y'all have been a great help. Yeah all of them. I forgot that they make rifles. They are .22lr .22 hornet 7tcu and 44 magnum. He shot silhouette competitions with them. He also has a brand new Springfield Armory 1903a3 match barrel. Stainless Ruger Super Blackhawk 44 mag 10". A bunch of Thompson Contenders, and a pre 1964 model 94 Winchester .30-30 Yeah I know I cant exactly look forward to the day I get these. My dad has one. He bought it new 10 years ago. Springfield Amrory M1A. Match barrel 1/4 minute sights. He shoots service rifle matches with it. It shoots better than we do. At 200 yards wherever the sights point is where the bullet will hit. I will inherit it one day. I don't have a sks. Are the type 56 chinese ones any good. I love old interesting com-block weapons. I enjoy learning everything about them. I already have the ammo I think an sks would be a welcome addition. Besides they are rather inexpensive. I know they used to be dirt cheap.